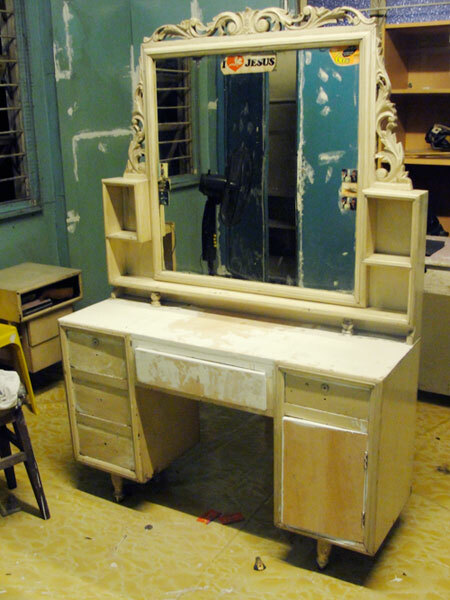 We had this vanity dresser since I can remember. I don't really appreciate it that much then, and even let my brothers have it for years. But I had my eye on this for a while (those details on the frame are sooo pretty). Thank goodness our house prettify project got me the chance to grab this for my selfish self. I don't take credit for the carpentry work, thank you carpenter for doing that for me. But I did spackled, sand, primed and painted this thing. I know that's the easy part, but still... I'm kinda proud you know. You can also see how my not-sticking-with-the-moodboard curtain purchase came about. I don't hate it, but I'm NOT in love with it either. It's a pretty print, not just what I'm going for. I'll probably change it even though I told myself otherwise. 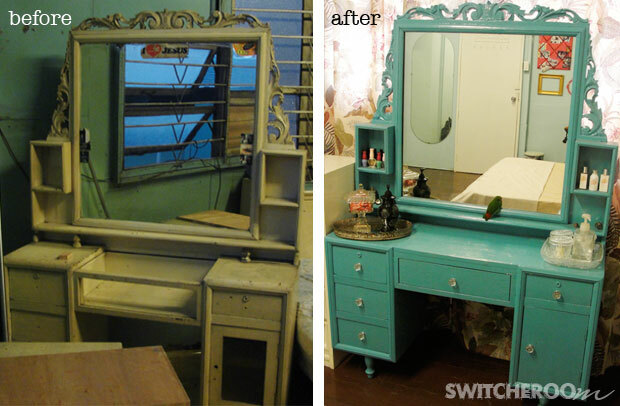 Oh by the way, the vanity is in the same room on both the before and the after photos. Another "before and after" by itself don't you think? She looks out of this world...love her color...hop over and show her off at my NIFTY THRIFTY TUESDAYS PARTY...hope to see ya there:) Love your blog, so I’m going to follow along. Wishing you and your family a very Merry Christmas! That is a shocking difference! I love, well done!!!! Wow does that color pop! It is actually my favorite color. The before and after are a stunning difference. What great storage too. What a great transformation! Love the color. I'm a new follower! Wow! This is a beautiful piece! Great work! Wow,w hat a difference! I love the detail on the mirror! Great color choice. Wonderful transformation! Congrats on a job well done. This really caught my eye over at Under the Table, it looks great and I love the color! What a before and after. Wow. Hope to see you join in! Meg & Anne - Thanks, I LOVE the color too! My new fave. Nicolette - Joined your party, thanks! Moogie - followed you right back ;) Thank you. Beautiful! I love the way it turned out! 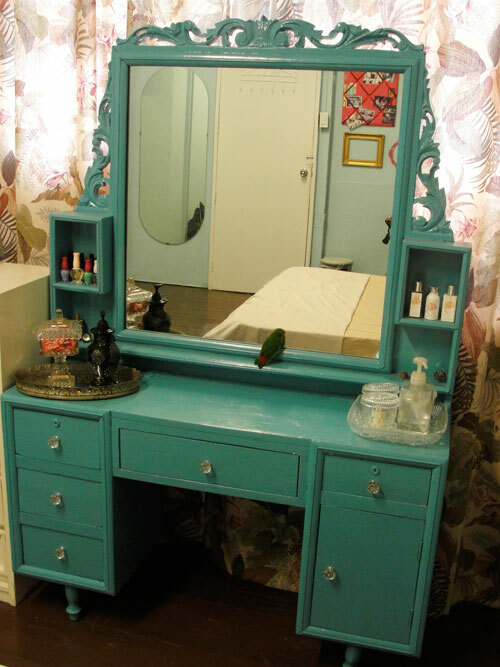 I just did a turquoise vanity too but yours is absolutely stunning!!!!! The final before and after is amazing. 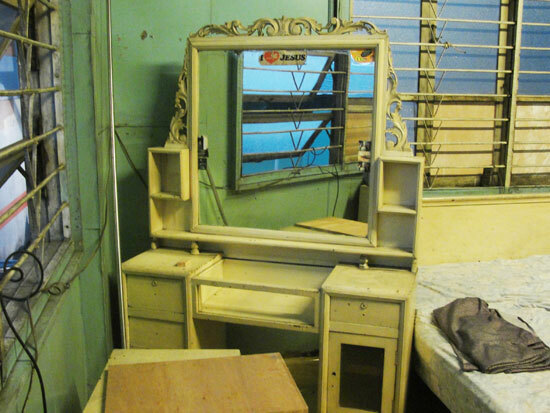 I never would have guessed the dresser was in the same spot in both pictures. You did a great job. I love doing vanities they turn out so cute. this is adorable. p.s. What color is that??? 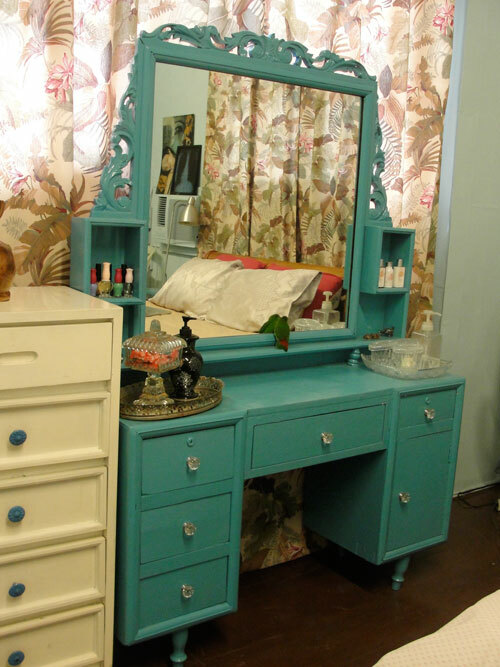 Oh...I love this vanity. It's such an unusual design..retro on the bottom and victorian on top...really never seen anything like it and it looks great painted turquoise. I have decided since I LOVE this so much, I am going to feature it on Thrilling Thursday this week. Feel free to stop by and grab and "I Thrilled" featured button off my sidebar if you would like :) Thanks for linking up! Thank you so much everyone for the kind words. @Lori - Looking forward for the feature. Thank you! I absolutely love this. It is EXACTLY what I am looking for; color, style, etc. If you EVER want to sell it, I'll drive wherever you are to buy it! LOVE LOVE LOVE. Thanks for sharing. It looks so great, and I love the color! Gorgeous color and the room looks great too! luv the dresser. reminds me of shabby chic. hi dear! i suddenly had goosebumps when i saw this post! i also changed my dresser last year and its the same color! and the handles too! ohmy... can i say we have the same taste? tsk we shouldve made our makeover rooms together! great minds think alike? haha :) thanks for dropping by.